From the very beginning of his career in amateur golf, Walter Travis was on a constant search for ways and approaches to improve the game of golf, whether in his play of the game, the equipment he used, or the grounds upon which the game was played. Systematic experimentation was a key part of Travis’s approach to discovery. The earliest expression of his innovative spirit may have been the installation of smaller diameter cups on the putting green at his home course, Garden City Golf Club. Travis had recognized that his success as a competitive golfer was being impeded by poor putting; thus, his decision to dedicate more of his attention and practice on putting. With persistent and concentrated practice using the smaller cups, while experimenting with various putting grips and stances, Travis became renown for his magical putting. It was the key to his unprecedented success as an amateur golfer, and became an integral part of the Travis folklore. Perhaps the most revolutionary example of Travis’s willingness to try new golf equipment occurred in 1901, when he decided to use the recently invented Haskell wound-rubber golf ball at the U.S. Amateur Championship held at the Atlantic City Country Club. The ball was manufactured by the B.F. Goodrich Company in Akron, Ohio, and had been introduced to eastern seaboard players by Charles B. Macdonald during the summer of 1901. According to Travis, only three eastern players had adopted the ball that the manufacturer claimed would add 20-25 yards to a drive. After one trial with the Haskell ball in a preliminary practice round, Travis decided to use it (Travis, 1905). Travis’s subsequent victory in the championship resulted in wide acceptance and use of wound-rubber golf balls, and signalled the end of the gutta-percha. An April 2005 Country Life in America article, attributed to the B. F. Goodrich Company, claimed that the “American invention has supplied new impetus to golf on both sides of the ocean, for the almost universal use of the Haskell ball has set an entirely new standard in all countries where the game is played, and has even made necessary a change in links that have been fought over for many decades by famous golfers”. Regarding the invention, the article further declared that “it is a curious fact, however, that the greatest improvement in the game since its establishment centuries ago in Scotland occurred not long after it became a national sport in America”. The Travis decision to use the Haskell Ball to win his second U. S. Amateur Championship provided major impetus for its worldwide acceptance. The Haskell Ball story had barely begun when, in 1902, Travis was introduced to a new center-shafted, aluminum putter developed by A.F. Knight, of Schenectady, NY. He declared the putter to be “the best putter I have ever used”, and decided to use it in the U.S. Open, where he finished second. Travis putting with his Schenectady Putter shortly after his 1904 British Amateur victory. That year, Travis wrote an article, published in Golf, in which he extolled the virtues of an aluminum putter. In 1904, the Schenectady putter achieved its highest level of popularity when Travis used it to become the first non-Brit to win the British Amateur. Golf shops could not keep up with the demand for the Schenectady. 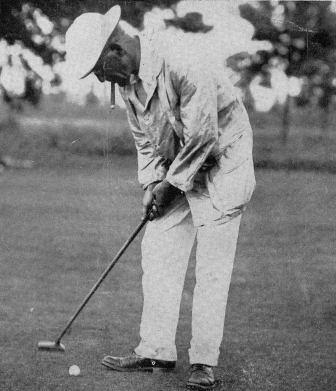 In 1910, the Schenectady became the center of a major controversy when the R&A Rules Committee banned center-shafted, mallet-headed putters, and included the Schenectady among those prohibited. The ruling was met with an outcry in the United States, led by Walter Travis, that resulted in the USGA’s first departure from R&A rulings when it approved use of the Schenectady Putter. In 1905, Country Life in America published a Travis article detailing his experiments with driver shafts that varied from 42 to 52 inches in length. Travis found that “the longer the shaft the lighter must be the head”. He concluded that “a somewhat longer ball can be secured with the longer club, but it is at the expense of a certain measure of accuracy”. Still, he acknowledged that there “are occasions when it is a mighty good club to have in one’s bag, as in the case of a hole demanding one or two unusually good shots to get to the green, or a long carry from the tee over a hazard”. A 1993 USGA Golf Journal article, discussing the development of course ratings, credits Walter Travis as having written “the authoritative treatise on handicapping” in 1901. Travis lent his strong voice of support for the Metropolitan Golf Association’s decision to use par as the basis of handicapping rather than bogey. Later, in his first edition of The American Golfer, November 1908, Travis wrote a brief article titled “Simplified Score Card” in which he proposed the addition of a column to the scorecard that “will clearly show the proper sequence for taking or giving strokes”. He explained that a player would “take a stroke at every hole that has a figure equal to or less than his handicap opposite it”. The simplified scorecard proposed by Walter Travis in 1908. He invited clubs to adopt the new system. Travis’s inclination to experiment, or try new ways of doing things, extended to turfgrass issues. In his neighborhood, a short walk from his home club, Garden City Golf Club, Travis was known for the small, experimental turfgrass farm in his front yard where he tried various varieties of grass and soil. His careful observations and study of turfgrass, including the effects of soil conditions, contributed to his accumulation of an impressive body of knowledge that he frequently drew upon in his writings and golf course consultations. The October 1923 issue of Golf Illustrated carried an article by Walter Travis titled “Undulating The Sand Green”. In this article, Travis presented both the virtues and the limitations of the ubiquitous sand greens used throughout much of the south. He reported on the “number of experiments” he had conducted in order to develop a surface that provided better “bite” to the ball and greater diversity of green contours. Travis believed that he was “eminently successful” in meeting his objectives, leading to his application for a patent as the “first and sole inventor of the improvement in the construction of sand putting greens” (Labbance, 2000). The patent application was not approved, but evidence exists that undulating sand greens were constructed on a few courses with very favorable reviews.